This week in my social media class, we focused on viral creation and how to create, share and promote viral stories. 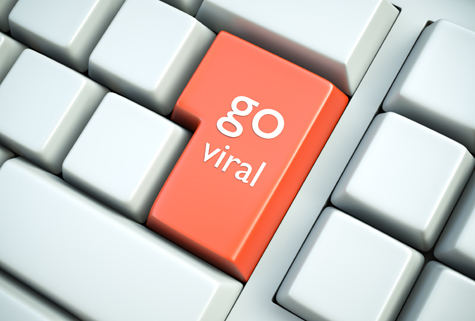 Several guest lectures have also commented on this idea of things going or being viral. Adam Lefkoe, see my blog I wrote all about him here: https://rachelclearyblog.wordpress.com/2013/10/11/adam-lefkoe-mo…-sports-anchor , said that something won’t go viral, if you want it to or try to plan to make it viral, it just won’t happen. It’s kind of like when someone is trying to be funny, but they just aren’t. Also, Joey Wagner spoke about events going viral, but he used this to his advantage, by promoting his events. Also, check out the blog I wrote all about him here: https://rachelclearyblog.wordpress.com/2013/11/08/joey-wagner-of…j-wagner-group. So, what I am trying to get at here is at going viral, being viral, having viral content, creating viral content, whatever you want to call it, is essential. An assignment we had to do for this same class I mentioned, ties perfectly into the idea of viral creation. We were asked to create campaigns for a company, of our choosing, through the mobile application Ptch. I won’t attach the whole assignment, since it is quite long and my professor, whom reads this blog, has already read it once; I’ll just go over it briefly. If you are not familiar with Ptch, the mobile application, it allows you to create and share videos, but most users, use it to tell some type of story. Which is where the assignment comes into the picture, pardon the pun, I created two Ptch’s for the company Gigi’s Cupcakes, which you can check out here: http://ptch.com/ptch/5272b309d3d71d7efa15fd67 and http://ptch.com/ptch/5272c74ace7b744ed51bcbb6 . These two videos tell a story about what the company’s product can do for you. This is viral creation. I created viral creation, while a tad redundant, I just think that is so cool. Each one of these steps is crucial to viral creation and by following these five steps it makes it more easy to not only create a viral story but to share it with others.